Government may outlaw reptile shows for kids in Melbourne. Reptile parties may be banned. Melbourne reptile displays under threat from business competitors with corrupt connections in government. Throughout Australia and Victoria in particular, everyone knows that we at Australias best reptiles, are the leaders when it comes to hands-on kids reptile parties, mobile reptile displays and live animal shows. Most people know that in Melbourne, Australias best reptiles are alone in letting people hold reptiles during their wildlife party shows. Other less experienced companies actively demonise reptiles and fuel public hatred of them by telling audiences that snakes and other reptiles are far too dangerous and unpredictable to handle. That is except by themselves of course. These handlers, then �big note� themselves and their alleged handling skills, pretending that they are far beyond the ability of pretty much everyone else but themselves. That these statements are obvious lies is shown by the fact that world-wide there are millions of people keep snakes and other reptiles as pets and they tend to handle the reptiles daily and without killing either themselves or their pets. Since 2006, two newly licenced and very inexperienced demonstrators and two staff at the government-run Melbourne Zoo (better known as the business enterprise calling themselves Zoos Victoria) have been waging a bitter and twisted campaign to demonise Australias best reptiles and the hands-on reptile shows the company does. They want to make it illegal for anyone to see any reptiles or wildlife anywhere except at their own three dysfunctional zoo sites, at Parkville, Werribee and Healesville. The motivation is purely commercial as these people try to steal the customers and business Australias best reptiles has captured via their vastly superior displays and presentations. The novice demonstrators are Sean McCarthy, with no snake keeping experience pre-dating 2005 (and this is by his own admission on internet forums and the like) and the similarly inexperienced novice Michael Alexander, with slightly more expertise than McCarthy but of similar reptile handling vintage. McCarthy calls his outfit the snake handler which is an odd name as his preferred handling means is to use barbaric metal tongs to grab and attack the snakes. This is rather than actually handling them. When he tried to monopolize the phrase snake handler for commercial reasons, the trademarks office quite properly knocked back his application, no doubt questioning why a man who is a tong handler would want to call himself a snake handler. But if he had applied for the phrase, tong grabber, the man who attacks snakes with metal tongs, there is little doubt he would have got the trademark on the basis he could prove prior usage and was well known as the tong mutilator within the reptile fraternity. Michael Alexander calls his company Black snake productions, and he too attacks snakes with metal sticks. Somone else actually has a black snake trademark registered, but Michael Alexander treats other people's intellectual property with disdain. In fact both Michael Alexander and Sean McCarthy are well known as police protected criminals, who have successfully evaded charges for a whole host of criminal offences. Michael Alexander's only redeeming feature is that unlike McCarthy, he doesn�t market himself as a snake expert and do courses that teach other unsuspecting people to put the lives of the snakes and themselves at risk by learning to use tongs to handle snakes. The two novices and two staff from Melbourne Zoo have made a series of sworn statements for legal proceedings and posts on internet forums they control demonizing Australia�s Snake man Raymond Hoser, Australias best reptiles and pretty much anything to do with allowing kids or adults to hold reptiles during educational reptile displays. Yes, they all demonize reptiles more than even the most dramatic of B-grade Hollywood flicks. 1 - That no person should be allowed to touch or handle a snake at a reptile show, because the public are all idiots and they will rush into the bush the next day, pick up a deadly snake and kill themselves. For the record, this has never happened in the wake of an Australias best reptiles show, but the argument about sending the wrong message in reptile shows, is peddled daily against Australias best reptiles in a manner that broadly equates Raymond Hoser with a serial mass-murderer! 2 - In terms of lizards, these ratbags argue that while non-venomous, lizards are biological nightmares, with many bites leading to infection and death. This includes for species such as Bluetongue lizards. Melbourne Zoo veterinarian, Helen McCracken made such statements numerous times on oath in legal proceedings in 2011 and again in 2012 and was believed by the evidently corrupt magistrate Greg McNamara and later Judge Judy Jenkins, with McNamara who by his own admission knew nothing about reptiles! For the record, no one has ever been killed by a bluetongue lizard or any other kind of lizard in Australia! Jenkins apparently alleged she complete expertise in reptiles, even though there is not a shred of evidence to back the idea! I might also add that two Supreme Court judges did not agree with her asertions either and overturned her earlier corrupt decision against the snakeman. 4 � For frogs, the argument is simple. Kids who hold green tree frogs are bound to eat Cane Toads on their next Queensland Gold Coast theme park holiday! Put simply, the arguments raised by these people are ridiculous and known to be lies. The commercial motivation behind all this is to undermine the leading hands-on reptile shows by Australias best reptiles so that the dysfunctional government owned Melbourne Zoo and these second rate reptile displayers can take the clients from the company that has experts who provide proper hands-on reptile education. Most seriously, corrupt officers within the Victorian Department of Sustainability and Environment (DSE), now called Department of Environment and Primary Industries (DEPI) who work with Melbourne Zoo in the same Ministerial umbrella and have an ongoing corrupt relationship with the other two demonstrators (and ignore their repeated breaches of the law) have used these statements to charge Australias best reptiles with the alleged offence of allowing people to hold reptiles at shows in shopping malls, animal parties, Melbourne snake shows, Victorian reptile displays, kids reptile parties and the like. Because the Victorian Wildlife Act in its preamble states that its purpose is to give public access to wildlife, Australias best reptiles hands-on shows are in fact legal. This is in spite of claims to the contrary and in spite of corrupt magistrate Greg McNamara finding that Australias best reptiles had broken the law in allowing people to hold reptiles (in Feb 2011) during shows at various venues over previous years. However as of 2014, DSE have now stated in writing that they are now revising animal, wildlife and reptile laws and based on comments made at VCAT in 2008 and since, it seems likely that both private ownership of reptiles and any form of hands-on in live reptile displays will both be banned at some stage in the period between 2012 and 2022. The Minster in charge of DSE, the environmental vandal Ryan Smith has absolutely no control over DSE or inclination to intervene and so it seems likely that the bans may come to fruition without a hard-fought battle. Please note that, Raymond Hoser and all the other staff at Australias best reptiles will be leading the fight for the rights of the Victorian public and be pushing for the retention of hands-on reptile shows and the right of private people to have reptiles as pets. Be warned, the enemies of private reptile keepers and those who want hands on reptile shows include Jon Birkett and Helen McCracken at Melbourne Zoo, Former head of DSEs enforcement branch, Ron Waters, along with underlings Emily Gibson and Glenn Sharp, as well as novice snake handlers Michael Alexander and Sean McCarthy. All have made public statements condemning hands-on reptile shows and all by their actions have also put the rights of all reptile-keeping Victorians at risk. Private ownership of reptiles was a jailable offence for most Australians for the two decades to the mid 1990s. It was only as a result of Raymond Hosers single-handed campaign, culminating in the publication of the book Smuggled and Smuggled-2 in 1993 and 1996 by corageous book publisher Charles Pierson (for the first and most important of the two books) that forced state governments Australia-wide to allow private ownership of reptiles as pets and also for companies like Australias best reptiles to do hands-on reptile shows in schools, kinder reptile shows, children�s reptile parties, reptile incursions and the like. 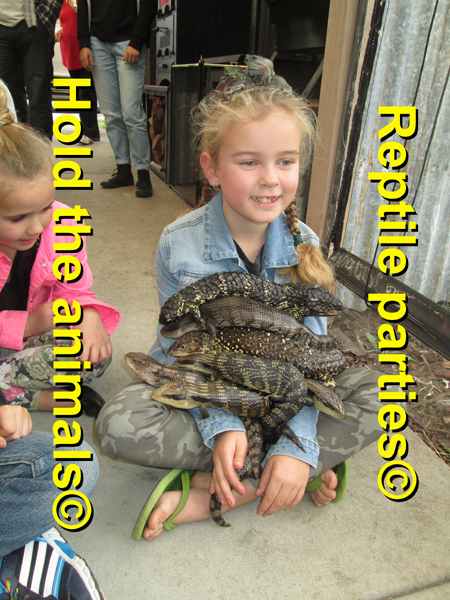 These hard won rights which allow everyone ibn Melbourne and other parts of Victoria to see and handle live reptiles and other native wildlife at school incursions, reptile displays at events, kids birthday parties and the like as currently enjoyed are now at risk of being permenantly taken from them. All the best from the snakeman. Melbourne Reptile Shows. The snake man is Raymond Hoser and the phrase reptile parties are both legally registered and protected trademarks for reptile party shows and other parties and education in Melbourne. Copyright 2013 Rreptile parties, Melbourne, Victoria, Australia and elsewhere.